A Lurgan man is to go on trial for animal cruelty after he denied beating a puppy to death with a hammer. Standing in the dock of Craigavon Crown Court on Thursday, neatly dressed in a white shirt and tie, 23-year-old Kyle Keegan entered not guilty pleas to the two charges against him. Keegan is charged with causing unnecessary suffering to Sparky the puppy on February 3 this year and criminal damage to the dog in that “without lawful excuse destroyed a crossbreed puppy named Sparky belonging to Ellen Hoy intending to destroy such property or being reckless as to whether such property would be destroyed or damaged”. 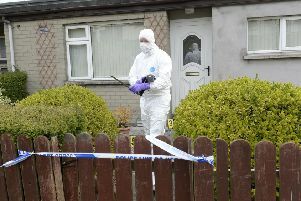 Previous courts have heard how the bloodied remains of the 12-week-old pup were uncovered in a bin in the Ailsbury Park area of Lurgan after a house party and that an initial postmortem on the pup’s remains revealed how Sparky had sustained a number of fractures as well as severe brain trauma. At one stage there had also been allegations that Sparky was put into a microwave but despite sending tissue samples to Scotland for analysis, no evidence of that has been forthcoming to date. Previous courts have also heard that as well as the forensic aspect of the investigation, police conducted enquiries with social media outlets after the incident was allegedly broadcast online. Following Keegan’s denial on Thursday defence barrister Barry McKenna said two expert reports would be required but that he didn’t have a time frame for when they would be available, adding that he did not think matters would ready until a few weeks time. Prosecuting counsel Nicola Auret told Judge Patrick Lynch QC the PPS were ready to go to trial and asked the defence to look at the possibility of agreeing witnesses. Keegan, from Gilpin’s Manor in Lurgan, was freed on continuing bail and Judge Lynch said he would review the case next Wednesday.